Amy Rebecca Klein reviews David McLoghlin's translation: "to read Winter is to surrender to the flood of images we live in." 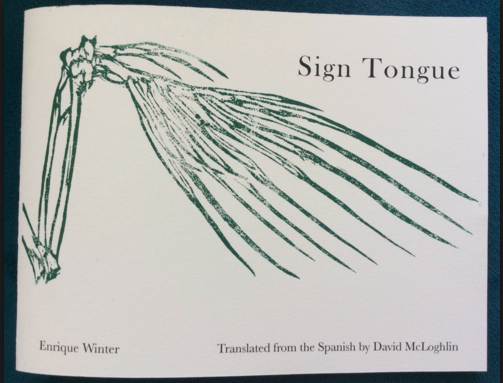 The title of Enrique Winter’s new chapbook, “Sign Tongue,” translated by David McLoghlin, poses a challenge for poetry: Can the flat mirror of language contain the fullness of the tongue, the way we taste and even kiss? Can we ever translate a single mother tongue into a form of collective experience when the real has no language at all, but has given rise to so many? Winter, who hails from Chile and has lived and studied in New York, and whose poems appear in “Sign Tongue” side-by-side in English and Spanish forms, understands that to name the world in only one language is to impose borders on his imagination. Yes, if naming the world was the first thing Adam did, then it was also the task he could never do well enough—besides, of course, keeping Eve happy. How can one word—‘tongue’—mean both the cold and analytical and the warm and sensual? The sign, whether word or image, is always too simple to convey the thing we see. This conundrum is the one poets have struggled with since the beginning—but that we struggle with even more now, as poetry struggles to maintain relevance within a landscape that is increasingly visual, even digitally enhanced. If words are small failures occurring one after another in time, and poets simply put them together in lines, how can language hold a world of 3-D modeling, multi-layered computer circuitry, technologically optimized vision? And since we all know it is impossible to translate our lived experience into a definitive language, what on earth should we, as poets, do with our discontinuous way of speaking, our tongues caught between the signified and its image, the real and the abstract, the myth of the truth and the myths of the past? “Sign Tongue” is familiar with the prospect of failure precisely because Winter’s way of seeing the world, in all its sensual detail, is so rich as to be nearly impossible to contain in words. Most of Winter’s words play double roles, evoking two or more scenes occurring at once. The first poem in “Sign Tongue” pitches the subject back and forth over the unstable terrain of an active, yet impersonal verb: “UNFOLDS SAW WINGS / nails in the feathers / when gifting them in this candlelight meal.” No sooner does the protagonist of Winter’s book, the character of the word, which is to say also the act of its meaning unfolding, sit down at the table, but he becomes the agent of de-creation, destroying the object he wants to animate. The word “saw,” which in its noun form denotes the violence of seeing, the way seeing an image pins it down, limits its freedom to become something else, reminds us of the way our language not only expands, but contracts, at once opening our wings and nailing us to the earth, hints at times at the heavenly gift of freedom while at other times, enacts upon the other our thoughtless, man-made violence. Winter, whose last book “Skyscrapers” encapsulated in small snapshots the lives of men and women in troubled, often violent relationships limited by social and economic constraints, appears in “Sign Tongue” once more as an absent narrator peering through the bus window—but this time at the act of observation itself. In his new work, Winter’s acknowledgement of the masculine language’s historical relationship to the art of looking is admirable and even feels, at times, new—as soon as the personification of the word “unfolds” presents his beloved with the gift of his own violently-edged wings, Enrique cuts short the candlelight evening with a quick stanza break, “then the red / swelling of the scabbard / and the knife // the cloth torn.” As in Yeats’ “Leda,” the narrator who destroys the feminine object by nailing it down in language remains conscious that the “white rush” of experience belongs not to the Godlike voice of the observer, but to the feminine object that language continually observes. The idea of lived experience and language as lovers hopelessly trying to relate to each other on date that language will only ruin appeals to Ben Lerner’s concept of poetry as failure; in his June “Diary: On Disliking Poetry” for the London Review of Books, Lerner describes poetry as a masculine plateau of hubris from which the individual writer must inevitably fall, and only on the way down, glimpse the full potential of the art. But Winter’s interweaving of language and body in a manner that is itself fragile, feminine, sensual, and self-aware feels like an acknowledgement of the power of abstraction to provide space for both the observer and the observed, a kind of subjectless place where poetry lives and dies without any sort of goal to reach. way to other limbs that need it. The “it” here is the word, which Winter defines throughout the book as a “wound,” an absence or lack in the way that Anne Carson’s eros is the wanting to be whole that can never be. The ecstasy of drowning in a beautiful, meaningless language is Winter’s forte; he seems to feel an intense joy in diving into this mangled place. At times, the art of losing even seems like a place he’d like to live in permanently, or at least die in—for it seems to form the perspective from which Winter can access others. Yes, there are always other swimmers, the seaweed that grows on the ocean floor, and even “the coffee grain of trunks / in layers reading them all horizontally as landscapes and vertical / portraits of passion failure.” The question of how the body, his body, was wounded seems less important to Winter than the wounding of the entire earth and the way language fails over and over to do anything about it. At times, Winter’s rapid-fire perceptual shifts can generate a case of productive vertigo. Which way to read the gorgeous image that is this coffee-grain of tree trunks coated in blood? Horizontally or vertically? Of the many frames of reality his skillful enjambment and syntactical mirrors refract, which is the real one? And who is speaking to us? Only rarely does Winter’s “I” appear—and when it does, it speaks with only the shy sadness of the self emerging naked from the flood of its debate—“I had lost the healthy habit / of putting names to the things I love.” As a reader, often wants to see more of this “I,” to meet him face to face, and not only his language, to see what he would say to us if he could stay with us for a day or two. But to read Winter is to surrender to the flood of images we live in, to the impermanence and transience that make life go by too fast, like a movie or the news. Our current position is defined by multiple layers of viewing—we are in the past and the present at once, we are here and we are not here at once. Winter prefers poetry as cloud watching, the way Google’s neural networks identify patterns and iterate on them. To see the thing is not as important, after all, as to see its possibilities—this is what the imagination is for, to say “or,” “or,” “or” over and over—and to say that my “or” is different than yours, and that’s fine, even when it means we can’t understand what’s right in front of us. The important thing for poetry is to remove the boundaries between what a thing is and what it might be. The important thing is to be in the flood, to be changed by the mirror in which one finds oneself, to see an empty plate and think of a whole planet—in poetry, “when a mirror is being moved,” it does indeed “move the one it reflects.” What poetry can do is change us as we look at the world, even if it does not change the world itself at all. In refusing to decide who its speaker is, Winter’s work playfully subverts the one-two surveillance-subordination punch that defines this now. In the only barely ironically-titled “FOR THE GENTRIFICATION OF THE SKY,” Winter’s speaker “look[s] at the entire country from above” as a woman’s body, but also problematizes this totalizing ‘target’ view of our planet that is the top-down view of colonizers, military planes, and now, drones. Enrique would rather work to destroy the map itself with ambiguity, with the feeling of freedom that comes from being alone in a new city and rushing from one place to another, of almost hovering in air. As soon as he sees the woman’s “cleavage,” he comments, “although maybe it isn’t at all / the enemy swarms between continuous lights / streets or discontinuous you arrive turn on turn off go out / again the city’s a motherboard of love yours passed over under a tree / the green question with plugs that won’t leave the computer.” Winter’s skillful hand at maintaining tension in between two states in each moment of the poem—continuous or discontinuous—means to Winter that each moment the real is a place of possibilities, rather than a place of inevitability. So “here is sculpted with the eyes,” imperfect, but still—to have the ability to sculpt. Winter feels that joy, and he appreciates his own freedom to invent in a way we often forget we should. But to conjure the impermanence of now just at the moment of its slipping away is Winter’s real gift: “In layers the sea is setting on the sun / the memory of the memory of light / sheets that slide back the spilt milk / during the front crawl / and a new opportunity to understand ourselves / in pairs the night brings.” When Winter is with us in the present, he feels the deep reflections of each word, the way the sea sets on the sun, and not the other way around, when you stare into the ocean, the way each wave is a memory of one before, and also a place in which we can connect—in small ways, acts of love, mistakes, spilt milk, begin to understand ourselves. Winter’s eyes see the way the world fades into us and we fade into the landscape, one of its many waves. So with the way we dematerialize these days into digital forms and objects dematerialize into numbers and some kind of thing they call ‘the cloud,’ we may be even more ready than ever to enter Winter’s “biggest photo” of all, the one that “reflects the curtains ready to fly / and the outside.” You can almost hear Keats’ music in that whoosh of wind, the kind of potential energy of the world outside the self that the poet only, at times, is able to grasp, and that seems always to be so much larger and deeper and more beautiful than any words can convey. As Keats wrote, “heard melodies are sweet, but those unheard / Are sweeter; therefore, ye soft piles, play on; / Not to the sensual ear, but, more endeared, / Pipe to the spirit ditties of no tone.” It’s the sensuality of negative space that Enrique is after, the place where he isn’t.” This is a place of strong generosity, a place without any real bitterness for the failure of words—“let the street still me,” he writes, “between what things say / and me.” Winter’s poetry is always in transit to that wide-open space some might call abstraction or nothingness. Still, it’s the street itself, how it feels under his feet that makes him want to stay. Amy Klein is a poet and writer living in Brooklyn, New York. Her work has appeared in the Believer, the Talkhouse, and the Best Music Writing book series. Her honors include an Academy of American Poets Prize and a scholarship to the Ashbery Home School, where she first encountered the work of Enrique Winter.